These steps show how to simulate an X.509 device on your development machine running Windows OS, and use a code sample to connect this simulated device with the Device Provisioning Service and your IoT hub. Navigate to the root azure-iot-sdk-java` directory and build the project to download all needed packages. Navigate to the certificate generator project and build the project. 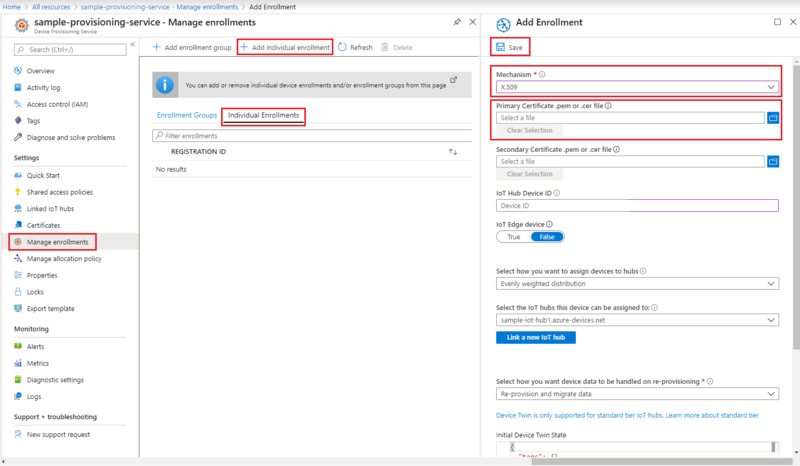 You will use sample code from the Azure IoT SDK for Java to create the certificate to be used with the individual enrollment entry for the simulated device. Using the command prompt from previous steps, navigate to the target folder, then execute the jar file created in the previous step. Enter N for Do you want to input common name. Copy to the clipboard the output of Client Cert, starting from -----BEGIN CERTIFICATE----- through -----END CERTIFICATE-----. Create a file named X509individual.pem on your Windows machine, open it in an editor of your choice, and copy the clipboard contents to this file. Save the file and close your editor. In the command prompt, enter N for Do you want to input Verification Code and keep the program output open for reference later in the Quickstart. 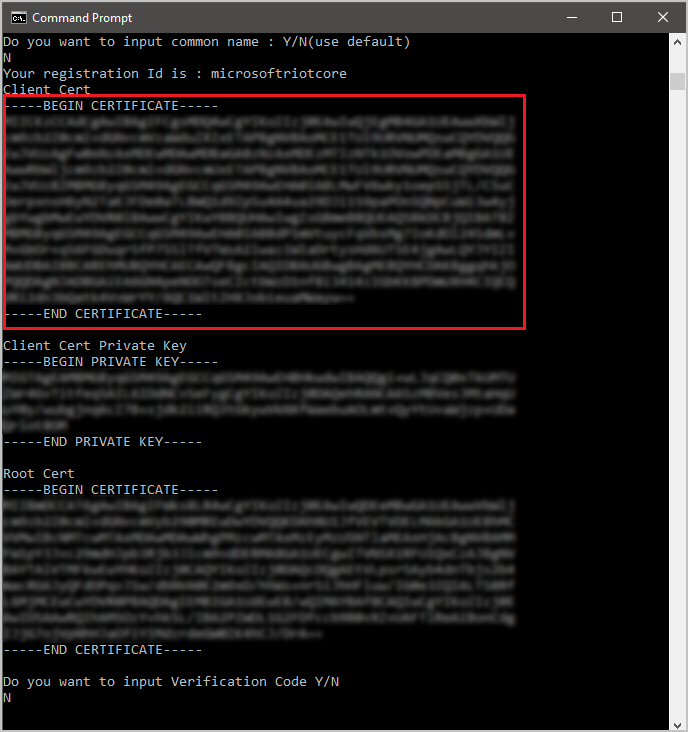 Later you copy the Client Cert and Client Cert Private Key values, for use in the next section. Sign in to the Azure portal, click on the All resources button on the left-hand menu and open your Device Provisioning Service instance. Under the Primary certificate .pem or .cer file, click Select a file to select the certificate file X509individual.pem created in the previous steps. Upon successful enrollment, your X.509 device appears as microsoftriotcore under the Registration ID column in the Individual Enrollments tab. On the Device Provisioning Service summary blade, select Overview and note your ID Scope and Provisioning Service Global Endpoint. Open a command prompt. Navigate to the sample project folder of the Java SDK repository. Edit the file /src/main/java/samples/com/microsoft/azure/sdk/iot/ProvisioningX509Sample.java, to include your ID Scope and Provisioning Service Global Endpoint as noted previously. Also include Client Cert and Client Cert Private Key as noted in the previous section. Build the sample. Navigate to the target folder and execute the created jar file. 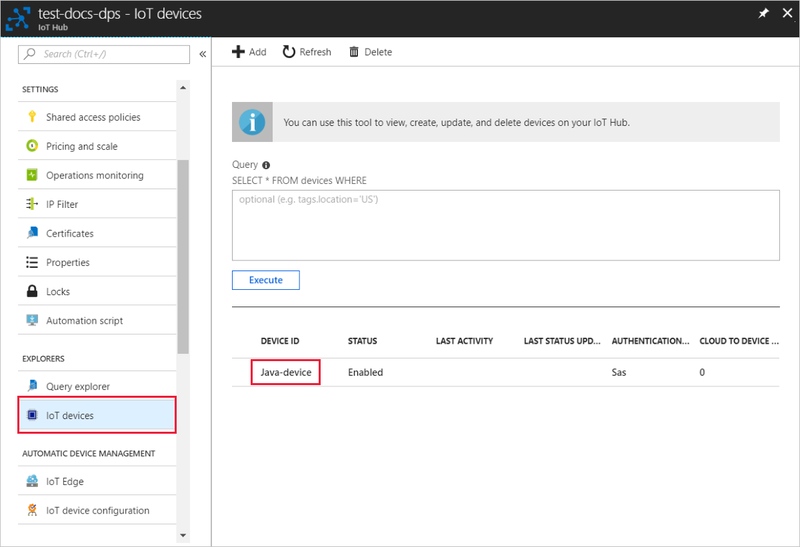 In the Azure portal, navigate to the IoT hub linked to your provisioning service and open the Device Explorer blade. Upon successful provisioning of the simulated X.509 device to the hub, its device ID appears on the Device Explorer blade, with STATUS as enabled. You might need to click the Refresh button at the top if you already opened the blade prior to running the sample device application. In this Quickstart, you created a simulated X.509 device on your Windows machine. You configured its enrollment in your Azure IoT Hub Device Provisioning Service, then autoprovisioned the device to your IoT hub. To learn how to enroll your X.509 device programmatically, continue to the Quickstart for programmatic enrollment of X.509 devices.